This fall my community garden neighbor surprised me with one of his favorite vegetables: the banana squash. He proudly told me that this large cylindrical squash can grow up to 45 pounds. He also said that he uses the banana squash in place of pumpkin or butternut for his holiday baking. 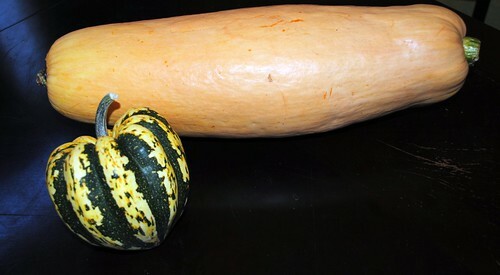 Normally, the task of cutting a winter squash involves two people, a mallet, and a large knife. However, cutting and peeling the thinner skinner banana squash was a breeze. My banana squash was fifteen pounds and I knew I wouldn’t be able to use it all at once. The first thing I did was cut it into thirds. I made of third of into a puree for baking and the rest was stored in the freezer for later use. I’ve used this method for puree for pumpkins as well. You can also use the oven but it takes so much longer. I found the microwave works just as well. 1. Use a four pound squash whether it be butternut, sugar pumpkin, pie pumpkin, or in my case four pounds of banana squash. 2. Cut the squash in half and throughly remove the stringy material and the seeds. 3.Cut the pumpkin in portions so it will fit into a microwave safe bowl (the larger the pieces the easier it will be to peel the skin later on). 4. Cover the bowl and put in the microwave for 15 minutes. 5. Carefully remove the bowl from microwave and stir the squash (be careful bowl will be hot). Put lid back on and microwave for another 15 minutes. 6. 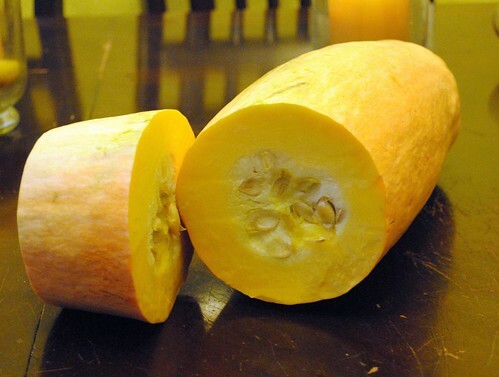 The squash is ready when it is very soft and slightly darker in color. 7. Once the squash has cooled, peel off the outer skin. 8. 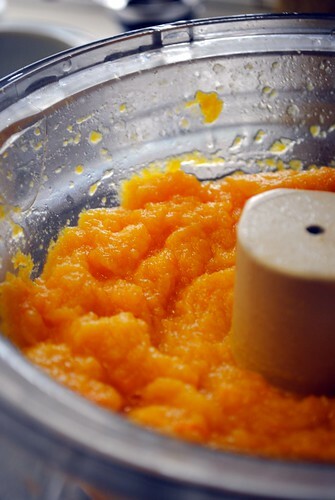 Blend squash in a food processor until it’s a nice, smooth consistency. 9. You can use the squash puree right away or freeze it for later use. Now that you have made your puree you can incorporate it in all kinds of recipes. 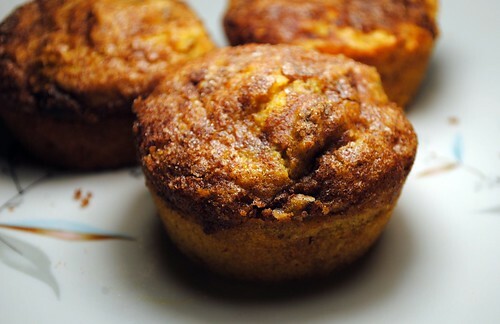 I recently used the bananna squash in two very different muffin recipes. 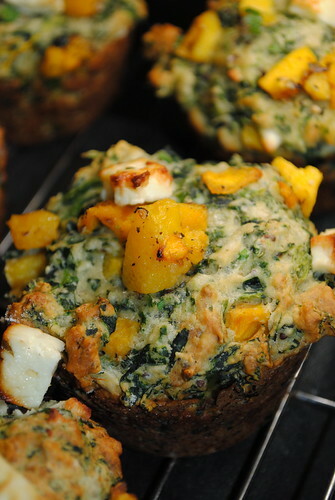 The Pumpkin and Feta savory muffin was from 101 Cookbooks and it included a blend of feta cheese, herbs, spinach, and of course the squash. The other recipe was Pioneer Woman’s Moist Pumpkin Spice muffins. These muffins were heavenly. I left out the icing as these muffins are sweet enough without it. I also substituted dried cranberries instead of currents. I have never heard of banana squash, is the flavour in any way similar to butternut squash? I love, love, love butternut squash and I have a sneaking suspicion my mom has grown banana squash. She receives mulch/manure/random garden stuff from a friend who owns a greenhouse waste management company and so every spring new stuff crops up and we have to guess what it is. I’m waiting for the giant (and wholly unexpected) pot plant in her front yard! Hi Joy, thanks for commenting. the banana squash isn’t quite as sweet as a butternut but it’s so much easier to cut that it’s worth it. I did best in the sweet muffin recipe.